Hi, I’m Sean Connolly an experienced and versatile UK based professional Voice Over Artist with Oscar-nominated credits! I’m a serial MULTI-VOICER with an immense range of inventive voices who relishes the challenge of creating many characters, or just the one if required! I am also a trained actor with almost 30 years of experience www.seanconnolly.co.uk so can turn my hand to all manner of character voices, accents and dialects. Regional UK and foreign accents are a particular skill. Perhaps your project needs a ‘straight’ single voice, then my ‘every-man’ style could be just what you need too. My natural speaking voice has been described as warm, informative, gentle, reassuring and fun. 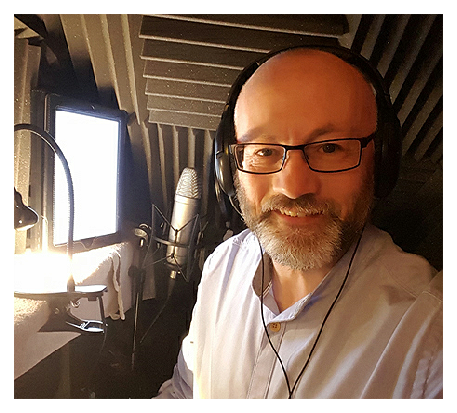 From cartoons to corporate, audio drama to adverts, dubbing to documentary, my creative professional approach helps me find the right voice (s) for your project. With my digital home recording facility I can send your edited audio by means of a high speed Internet connection as an MP3 or WAV file via email or using my web-based secure digital file delivery company. You can also still request a CD in the post!! Of course if you’d like me in your studio in person, then you need only say the word.